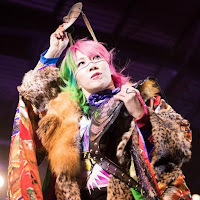 - Earlier today, WWE SmackDown Women's Champion Carmella and Asuka went back and forth a bit on Twitter after Asuka tweeted out a photo of herself with the caption, "Fabulous." Carmella responded, "Girls just wanna be Carmella" and Asuka replied as only she can, "It makes me laugh to death." Earlier this week on SmackDown, Carmella successfully cashed-in her MITB opportunity after Billie Kay and Peyton Royce beat down Charlotte. - Below, Asuka and Charlotte were featured in the latest Canvas 2 Canvas. Next week's subject will be Daniel Bryan.